I usually do not advocate the in-built tools of Microsoft Windows until I recently experienced the Snipping Tool. It came in my notice by chance when I was searching for a file whose name starts from “sni”. 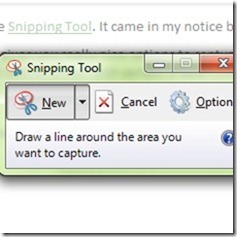 Snipping Tool lets you capture any part of your screen and save it as an image file. What else ? It gives you really nice options to capture the screen. Along with the old boring rectangular box, it lets you capture screen with a freeform snipping tool. Using this freeform tool you can capture any particular part of the screen with certain shape/size. Cool ? Write with a pen, and yes 3 different colors and the custom color as well, nice ? Erase the changes done with highlight, or pen tool. All in one, it’s a handy screen capturing tool. It’s light weight and does not block much of the memory chunks. And what else, it comes free with Windows 7 (not in home edition though). 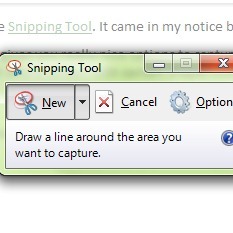 Here is one grab of the snipping tool with a freeform tool, I really liked it this option. GPS.. Should you PAY to USE?